Globe Run4Home 2012 - Cebu Online Registrations at www.globe.com.ph/run or at the Paseo de Ciudad, 1st level, Ayala Center, Cebu City. 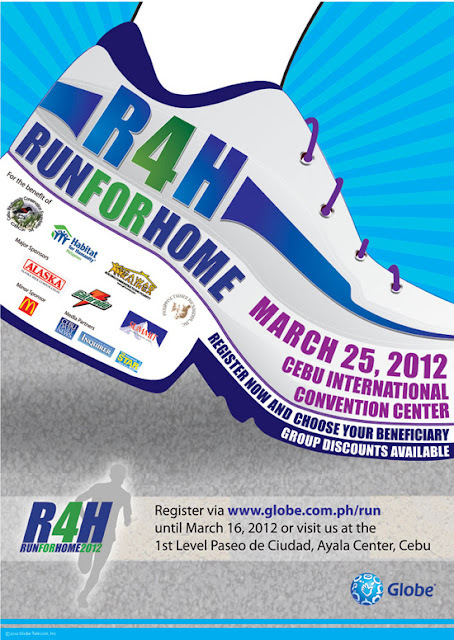 Globe Run4Home is on March 25, 2012 at the Cebu International Convention Center. Globe Run for Home, now on its fourth year is a race towards changing lives and making a difference. Globe Run4Home in Cebu inspires more individuals to help build homes, build lives, and build dreams. Through running, you actually help shelter key biodiversity areas, impoverished Filipino families and communities, and endangered animals through Partner-Beneficiares: Gawad Kalinga Foundation, Habitat for Humanity Philippines, Cebu Biodiversity Conservation Foundation and the Philippine Tarsier Foundation. *The registration fee icludes Race Singlets/Shirts in various sizes, Race bib number, Running timing chip, and Finisher’s Medal for the 21K category. 0 comments: on "Globe Run4Home 2012 in Cebu aims to shelter Biodiversity & Humanity"